Lately, faux leather moto jackets have been just as much of a staple for me as my blazers. They look great with so many things and they’re such a quick and easy way to add a bit of edginess. Plus, they easily transition into next season. This one in particular ended up matching perfectly with these boots. How fab are these by the way?! I didn’t want this to come off too “matchy matchy” so I was trying to find a color that would really pop and compliment the grey. This plum top worked best and I think that this might be a new favorite combo for me. 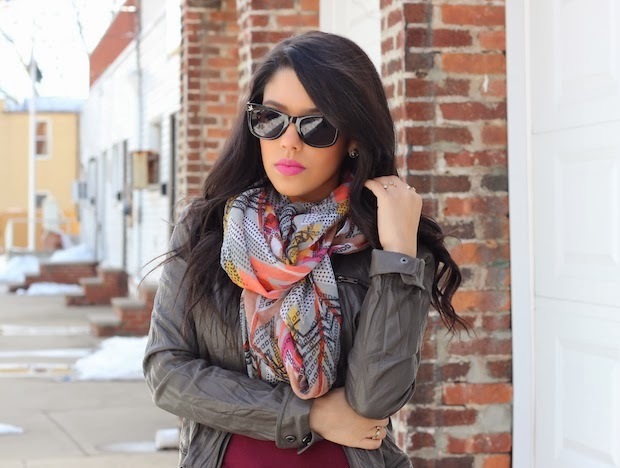 I realized that this scarf had both colors in the print, so it was a great way to tie the whole look together. I definitely keep things simple with my style, but I do enjoy mixing colors, textures and throwing in little elements of surprise!On Monday, I am going to San Francisco for 2 days to kick off a really fun campaign. I can’t wait to share all of the details with you guys soon! I am definitely looking forward to getting away from the east coast for a bit as it is back down to the 20s again. This winter is never ending! My eyes are wide open…..
Those boots are fabulous! Can't wait to hear more about the campaign you're working on! So cute! Those boots are fabulous! The scarf looks amazing and goes so well with the jacket and shirt. You look amazing in that combination and I must say that you are incredibly beautiful as well. Where did you get those boots?? ?